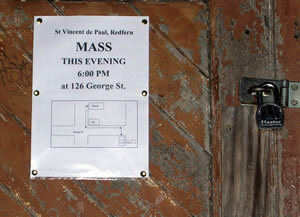 Last Saturday (23 July), the Redfern Aboriginal Medical Service - built on land adjacent to the Church - opened its gates to provide a space for a 6pm Community Mass celebrated by Fr Frank Brennan SJ AO. Frank is also a lawyer, and the Director of Uniya, the Jesuit Social Justice Centre in Sydney. At least 25 community members shared in a wonderfully tension-free Eucharist on a site almost as significant as St Vincent’s itself. Frank entrusted to the Community the hand woven stole he acquired recently in Jerusalem and wore to say Mass, with a request that the worsening plight of the diminishing number of Christians in the Holy Land be kept in mind whenever it is used. Several weeks ago the 6pm Saturday and Sunday Masses were moved out of the church and into the presbytery around the corner, unannounced other than by way of a subtle timetable change in the church bulletin at the beginning of July. The Community has been advised that this may be a breach of canon law. 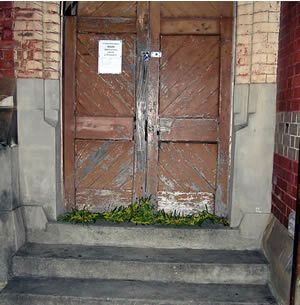 A candlelight vigil was held on the church steps outside the locked door on the following two Saturday evenings. 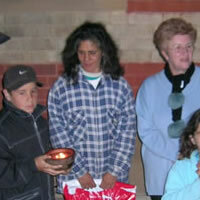 Despite the cold weather, the vigil attracted up to 20 of the "frozen few", including 5 or 6 Aboriginal people. The following letter appears in the latest issue of The Tablet. A copy was provided by Michael Hirst, Foreign News Editor. The community of St Vincent de Paul Redfern, Sydney welcomes the opportunity to comment on your recent article (18/6/5) on tensions created by the appointment of the Neocatecumenal Way to St Vincents. In relation to the night in question, the allegation of misbehaviour by the priest, contained in your article remains accepted by the community. The table/organ stool was irreparably damaged. 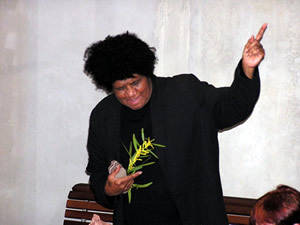 The community wishes it to be known that the calling of the police by the Neocatechumenal Priest was the aftermath of the heat generated by a simple question put to him in response to his actions: "Are you a friend of the Aboriginal people?" There was no disruption of liturgy by the parishioners The Bishop's quote of "defying the appointed celebrant" misses the point. 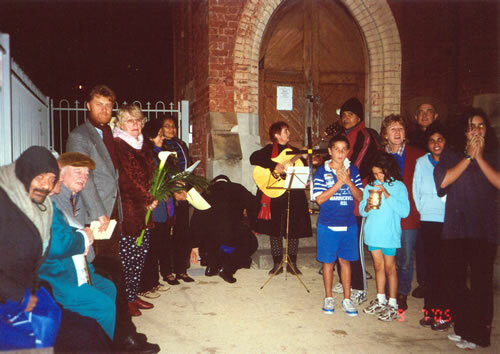 The community considers the actions of the priests, both in the restrictions on liturgy and the above mentioned behaviours, violate the orthodox liturgy of Redfern. The community consists of outstanding individuals who have forged deep and varied links with indigenous individuals and communities through their professional and their personal lives. The spectrum of disciplines within the community is very broad indeed. It is in the spirit of inclusive hospitality that such people gather around the Eucharist.Together these individuals constitute a dynamic community, not mere 'disciples' of Fr Ted Kennedy. Very few knew him in his days as a university chaplain. Perhaps the most sad and telling fact is that Bishop Fisher is more ready to call on the constabulary than he is to dialogue personally with this community. 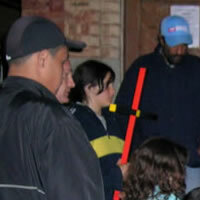 St Vincent de Paul community, Redfern. Elisabeth Burke, Peter Griffin, (Sr) Esmey Herscovitch R.S.C.J. (Sr) Mary McGowan F.M.D.S.C. Sydney Australia. I refer to your letter of 9 June 2006. I did try twice on the Tuesday to ring you and the phone rang out without going to any answering machine. You say that many Redfern parishioners have written many letters to me about the situation there over the past two years: in fact only one parishioner has done so, Sr Marnie Kennedy. You say that a group of people "have been begging a bishop or representative to speak to them about the escalating hostility" but that this has been denied them. This too is untrue. More than a year ago it was decided that rather than have "too many cooks" trying to resolve matters in Redfern, they would be handled by the Chancery of the Archdiocese, not by me. So the then-Chancellor, Monsignor Brian Rayner, visited the parish on behalf of the Archbishop and listened to the grievances. I know this occurred not only from Monsignor Rayner's reports but also from a letter from Sr Marnie who praised the visit to me. Thereafter I referred the only correspondence I received regarding Redfern - from Sr Marnie - to him to deal with; I will do the same with your letter to his successor. When Sr Marnie contacted me again, implying she still thought I should be dealing with these matters, I wrote to her to explain this was not the case. The Chief Pastor of the Archdiocese of Sydney is, of course, Cardinal Pell; the local Pastor of St Vincent de Paul Parish is Father Prindiville; as an auxiliary bishop I do what I can to help both, within the limits of the responsibility and directions given to me. We do not have 'regional bishops' here in Sydney in the sense that Sydney may once have had or some other Archdioceses may have today. My continuing responsibility in Redfern is one of pastoral care for the priests there (and Confirmation or Visitation when necessary, if delegated by the Cardinal). I well realize that supporting priests does not mean accepting and affirming everything they say and do. I must exercise judgment and communicate it. Your letter alleges that the clergy of Redfern have terrorized their parishioners, been insulting, humiliating and violent towards them, refused them communion because they are black etc. These are very serious allegations which I will of course refer them to the Archbishop. 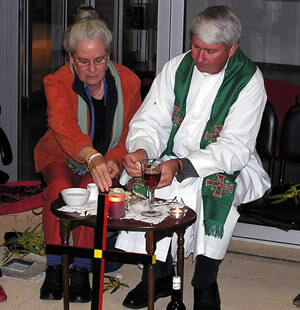 But I must say that I have had every indication that the clergy of Redfern have for the past two years been labouring under extraordinary pressure from those disgruntled by their appointment and/or their membership of a particular ecclesial movement and/or their pastoral and liturgical style. They have experienced escalating harassment and calumny. Priests sometimes complain that they are insufficiently supported in their work by their bishops: I will continue to do my best to support the appointed pastors in my area, especially when they ask for my help. You accuse me of a 'shocking', 'biased' and 'unreasonable' response in writing to the parishioners of Redfern in the terms I did on 3 June 2006. All I asked was that the Liturgy not be disrupted and that the responsibility of the parish clergy to determine liturgical style, furnishings, assistants etc., be respected, in accordance with the liturgical norms. I understand that at times Mass there has become so chaotic the church has had to be abandoned and the Mass transferred to the priests' house. If this is not the case - if in fact the rites of the Church and the responsibility of the clergy are being respected - then those to whom my letter was read will be unchallenged. But just as proper authority of Fr Kennedy over the liturgy was respected by others, so too I think that of his successors should be. I am and have always been willing to hear any church-going Redfern Catholics, including Aboriginal Catholics, who want to express concerns to me, though I do not think a public meeting would be very productive. I am also willing to hear you out as you remind me I have promised previously. If I have done anyone an injustice by my actions or inactions I am genuinely sorry. Pastoral life today is in many ways harder than it was when you began your 35 years of generous ministry. Parish Priests need the support of the laity even as they seek to serve them; they also deserve the care of their bishops and any clergy and religious around them. 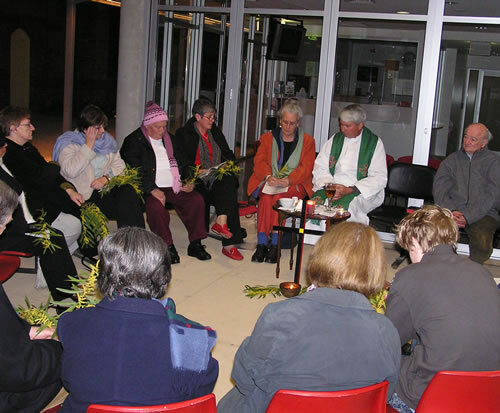 Please pray with me that the clergy and all those they serve in Redfern may continue to grow in the grace and peace of Our Lord Jesus Christ and to be built up as the household of God.